Nestled in southern Oceana County about 4 miles inland from Lake Michigan and close to US-31, the Village of Rothbury is quaint, quiet and rural, a perfect place to raise a family and enjoy a good life. 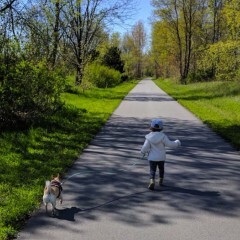 Twenty-two miles of smooth new pavement for you ride; that's the William Field Memorial Hart-Montague Trail, now finished and ready for you and your family to enjoy. The trail cuts through the center of the Village of Rothbury, providing strategic mid-point trail access. The trail was once a Grand Rapids to Pentwater railroad line dating back to 1872. From Rothbury you can head north on the trail toward Shelby and Hart, or south toward Montague, either direction making for a fun and memorable day's adventure. Find convenient free parking at our trail access point behind Village Hall, with plenty refreshments and food nearby. Check the links below for trail information and maps, courtesy of Michigan Trails Magazine and website. The Rothbury Village Council meets at 7:30 PM on the third Tuesday of the month unless otherwise noted, and the Rothbury Planning Commission meets at 4:30 PM on the second Tuesday of the month. Please download the 2019 Meeting Dates schedule at the link below. The meetings are held at Village Hall and are open to the public; everyone is welcome to attend. Weather and other factors can cause meeting times and dates to unexpectedly change. Please call ahead to confirm the time and day of any meeting you'd like to attend. 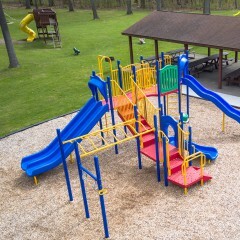 Check Out the Playground and Picnic Pavilion at Village Hall. Looking for a nice place to bring the kids for some playtime? Or perhaps a nice shaded place to picnic with family and friends? The playground and picnic pavilion at Village Hall is waiting for you! Swings, climbing and slides make great fun for children, and the picnic pavilion offers plenty of tables in a comfortable covered space. Surrounding trees and woods make it a park experience. If you'd like to reserve the pavilion for an event, call Village Hall at (231) 894-2385.